A so-called glacial cirque on the southeast face of Mount Washington in New Hampshire, Tuckerman Ravine provides a unique spring skiing and snowboarding opportunity. 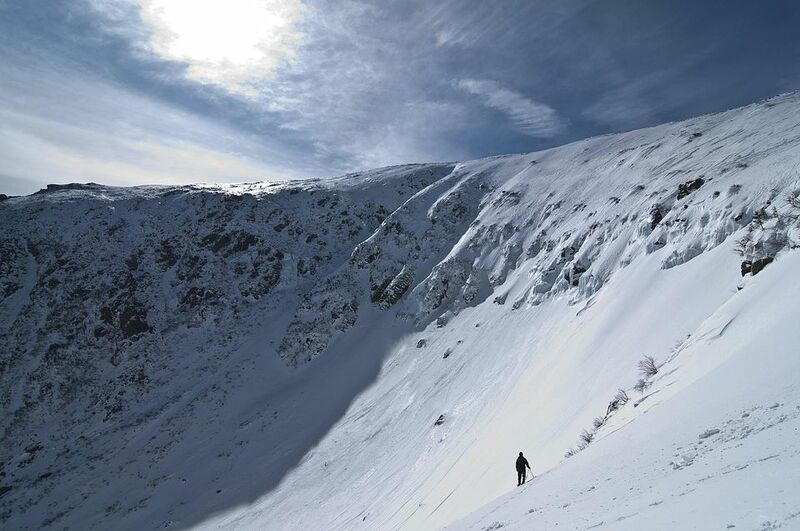 It's open year-round to hikers, skiers, and other outdoor enthusiasts, but since there's a significant risk of an avalanche during prime skiing months, Tuckerman Ravine is not a good choice for the novice skier in the middle of winter. Instead, they are encouraged to wait for spring, when things get a bit more stable. This is the very definition of extreme skiing in the eastern U.S., but if you're up for the challenge, Tuckerman Ravine and Mount Washington will definitely give you an experience to remember. Back in the 1930's ski races were common on Tuckerman, but none are quite so legendary as the American Inferno, a 4.2-mile race that ran from summit to base. In 1939, a skier by the name of Toni Matt accidentally took a wrong turn and ended up skiing straight down Tuckerman's headwall, covering more than 4000 vertical feet in six and a half minutes, easily winning the race. From there, the idea of skiing this massive wall just sort of took off, growing into a rite of passage for many skiers in the eastern U.S., with many flocking to its slopes between April and July each year. Tuckerman Ravine is a vast open bowl perched on the east slope of Mount Washington, the highest mountain in the Northeast. Every spring, expert, and extreme skiers and snowboarders make a pilgrimage there. The journey begins in your hiking shoes, as you walk up the 3.1-mile well-worn trail to the base of the ravine. Once there, you put on the skis or snowboard boots you've been carrying, hook the skis or board on a backpack, and start climbing up the steep slope toward the rim. It can be quite a workout, but the payoff is more than worth it. Basic first-aid kits are cached near the rocks by the Mount Washington Volunteer Ski Patrol, but you certainly don't ever want to use them if you don't need to. The weather on Mount Washington is notoriously fickle, changing at a moment's notice. And as already mentioned above, the possibilities of an avalanche are a constant threat. There's a reason Mount Washington is said to have some of the worst weather in the world: For decades, it held the record for the strongest wind gust on the Earth's surface. On April 12, 1934, wind speeds at the summit reached an impressive 231 miles per hour, which remained the standing record until it was finally broken in 2010. With these challenging conditions in mind, if you're a novice climber or skier, either wait until you have more experience before attempting Tuckerman or go with a very experienced guide and listen to what he or she tells you to do at all times. Tuckerman has numerous routes that skiers can choose when they decide to make their descent. The Left Gully is one of the easier ways down, although it still offers a suitable challenge for newcomers. Keep in mind, the further you move to the right, the steeper and more difficult the conditions get, with Center Gully and The Icefall both offering 55-degree angles or more. The Chute is another challenging run that passes between two large cliffs on the way down and is meant for experts only. To the far right, skiers will find Right Gully, which actually drops into an easier descent, however, so less experienced skiers are encouraged to stay near the edges. Tuckerman Ravine is extreme skiing and riding, so you need to know what you're getting yourself into before you head up the mountain. It's easy to get hurt there, and there's limited or no help if you end up having a problem. If you intend to ski or ride in Tuckerman Ravine, start by visiting the Mount Washington Avalanche Center website. On this site, you'll find weather and snow reports, weekend updates, photos, trip planning suggestions, and avalanche data. Any warnings will be posted here as well. Another popular site for people who ski Tuckerman is the Time for Tuckerman Community Forum. Also visit the U.S. Forest Service office in the White Mountains National Forest, where Mount Washington is located. Climbing up Mount Washington and skiing Tuckerman Ravine doesn't cost anything (except wear and tear on your body). If you want to stay in the area overnight, the Appalachian Mountain Club has the Hermit Lake Shelters and deals at Joe Dodge Lodge.